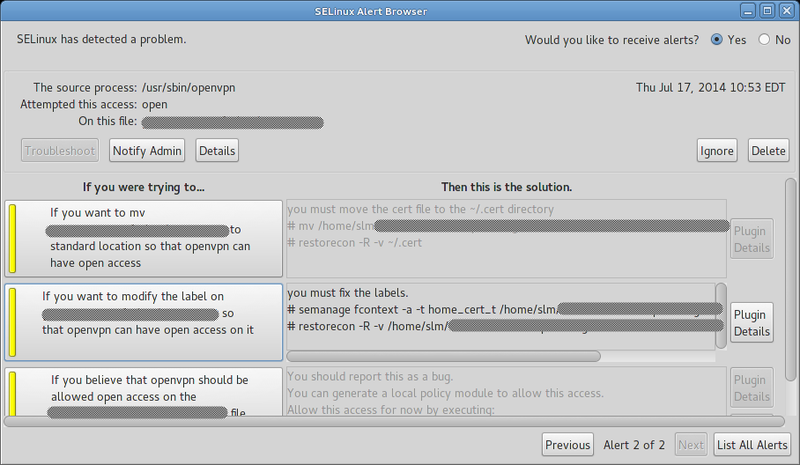 Having Fedora 20 64-bit installed, I have this old problem of conflicting OpenVPN and SELinux. Obviously SELinux prevents openvpn from launching. And then SELinux will allow the access to the certificates. The file will be moved to ~/.cert and in Network Connections there would be no certificates. I've tried to use cp instead of mv but that did not help and still I have this old problem of conflict. SELinux is disallowing the openvpn executable from accessing files on the filesystem in a specific location. Your best friend for dealing with these is to use the SELinux troubleshooter GUI. You'll then want to follow the advice to add the necessary contexts to your filesystem to appease SELinux. NOTE: In the above example I've selected the 2nd option and will run the commands semanage and restorecon as described to fix my issue here. You'll need to do the same for your openvpn issue. It should be identical to what I'm showing in the screenshots. Not the answer you're looking for? Browse other questions tagged openvpn selinux or ask your own question.